Painting for the People: A Look at the Cult-Fave Event "PowWow"
According to Jasper Wong, POW!WOW! is a spot on descriptor for both the impact art has on a person, POW!, and the reaction a person has to art, WOW! It’s also a Native American term describing a gathering that celebrates culture, music and art. Both meanings are fitting for POW! WOW! Jasper’s global art festival that has created hundreds of public murals in communities around the world during week long art, music and educational events. In 2017 POW! WOW! 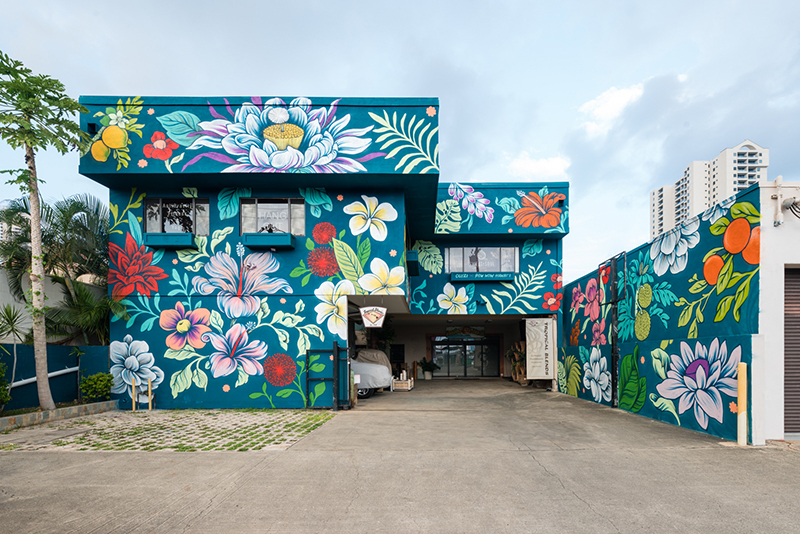 Hawaii in Honolulu brought together 120 artist painting 20 murals in one week. They also held 9 other festivals in cities around the world. But, this all started as a humble side project that might never have come to be if Jasper hadn’t been rejected from art galleries half a world away from his home state of Hawaii. Jasper is an artist and painter. In 2010 he moved to Hong Kong to learn about manufacturing products while continuing to paint on the side. But, mainland Chinese art was in vogue and consequently his art was continually rejected from galleries. Instead of waiting for a “Yes” Jasper created the opportunity for himself. He rented out a tiny, empty restaurant, painted the walls and windows white, few in a few artists from around the world and started his own gallery. They implemented two caveats: they would create paintings throughout the event and at the end they would destroy their work. They wanted to illuminate the creation process for attendees and make art without the intent to sell it. They called the event POW! WOW! The following year, Jasper decided to bring the event home. He assembled 12 local and international artists and scaled up the event from a tiny restaurant to a warehouse. Everything was on course for a repeat performance, until several sponsors dropped out. Jasper again was faced with a choice: stop the event before launch or fund it himself. He took out his wallet and charged forward, full steam ahead. With new found freedom, they decided to paint a large mural in the parking lot of the warehouse for the duration of the event. That one decision brought everything into focus for Jasper. Jasper and his team decided they would focus all future POW! WOW!s around week long murals painting exhibitions in communities around the world. Murals fulfilled many of the objectives Jasper had for POW! WOW! Using a public wall as a canvas meant people could witness the process of creating art while improving a community with artwork. 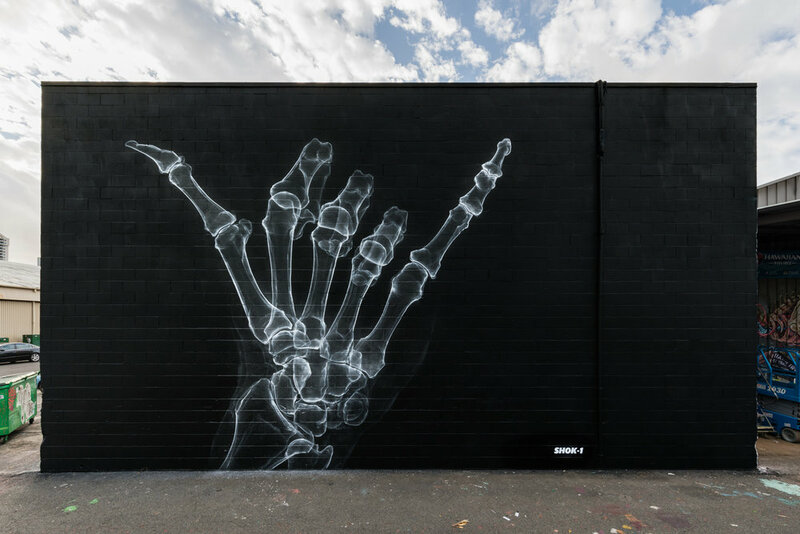 A wall is big so it’s easy for artists to collaborate. Being in a public space means it doesn’t necessarily belong to anyone so the work can’t be sold, giving the artists more freedom to create. Today POW! WOW! has three main missions: Beautify neighborhoods, connect artists, and support local communities through the arts. Artists work for free, donating their time and talents in exchange for a ight, housing, materials, and an opportunity to collaborate, create, teach and improve local communities. Jasper’s biggest hope with POW! WOW! is that it inspires people, especially kids, to work on and share their own creative projects. “POW! WOW! started as a side project.